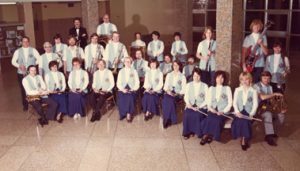 The St. Louis Park Historical Society has an excellent article about the history of bands in St. Louis Park. Our story starts in 1972 when Lorraine Brasket formed the band. She and other interested musicians put an ad in the community education newsletter, asking for volunteers. 16 people came to the first meeting and played for a month before they disbanded for the summer. Another effort was made, this time by calling people who were identified in old volumes of the Echowan as having been in High School band. The group hired Michael Holtz as conductor, paying him a small stipend with funds raised from the City and other fundraising efforts helped by the Lions Club, Boy Scouts, etc. They initially rehearsed at Susan Lindgren, then Central, and then the High School band room.